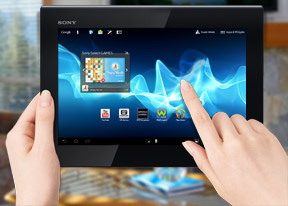 The Sony Xperia Tablet S packs an 8MP main camera that can capture photos with a maximum resolution of 3248 x 2432 and a 1MP front-facing camera. Sony has decided to slap on a custom camera interface and while we like the features, the UI is irritating. The viewfinder takes only a small part of the screen (especially in 8MP, 4:3 mode), while the rest of the 9.4" screen is wasted on buttons and a strip of previously captured photos and videos. It's annoying because you end up with a viewfinder that's about the same size as a phone's. As for the features, you get standard options like switching between the front and back camera, digital zoom, geotagging, exposure compensation and white balance. There's also a panorama mode. Autofocus can be set to auto, continuous, touch or infinity and you can pick between five scene presets. The image quality of the 8MP camera is not the best we've seen from Sony. Noise levels are fairly low, but the fine detail is as good as missing too. The camera has a tendency to overexpose shots (typical for an Xperia camera) and colors aren't perfect (white balance is a bit off resulting in bluish tint on occasion). Still, considering this is a tablet, the camera is probably too good than most people would need, so we won't hold the less than perfect image quality against the Tablet S.
The 8MP camera of the Sony Xperia Tablet S gets into the fray in our Photo Quality Compare tool, which is mostly populated by phones rather than tablets. At 8MP, it is one of the highest-res tablet cameras at the moment, although the sharpness of the camera is not on par with the best 8MP phone cameras as the first chart shows. Even the 5MP camera on the new iPad puts up a fight. The Xperia Tablet S relies on some pretty heavy sharpening to enhance the captured detail. In the second chart, colors look a bit dull and the patch of white noise has been processed beyond recognition. The gravel and grass patches are all but gone too. The third chart came out with a very noticeable blue tint (it's shot under artificial lighting) and the contrast was rather low. The main camera on the Xperia Tablet S can record FullHD videos, while the front-facing camera is good for 720p. The interface is identical to that of the still camera, though you lose most of the features - the autofocus modes (it always uses continuous autofocus), scenes and geotagging are gone. What you get is a time lapse option that snaps a frame every 1 to10 seconds. The videos are stored in MP4 files with around 14Mbps bitrate for the 1080p clips (almost the same bitrate as the one that Xperia phones use). Audio is stereo at 48kHz and 100Kbps. Quality is nothing to write home about, with less fine detail that we would expect out of a 1080p shooter. Colors are once again not accurate and photos are consistently overexposed. Again, we would only consider shooting a photo or a video with a tablet only when there is nothing else around (and how many people will buy a big Android tablet, but not have a smartphone on them?). You can also grab this untouched video sample - 1080p@30fps (10s, 16.3MB). The Sony Xperia Tablet S can shoot 1080p videos, putting it on par with the best that mobile phone cameras has to offer. But how good is the quality, really? The synthetic chart shows that practical resolution isn't quite on 1080p levels, despite the heavy sharpening that is applied to the video.